Nationality: American. Born: Cornelius Louis Wilde in New York City, 13 October 1915. Education: Attended Townsend Harris High School, New York; studied art in Budapest; attended Columbia University, New York, briefly; College of the City of New York, premed degree; studied acting with Lee Strasberg. Family: Married 1) the actress Patricia Knight, 1938 (divorced 1951), one daughter; 2) the actress Jean Wallace, 1951 (divorced 1980), one son. Career: 1940—member of the U.S. Olympic training squad in saber; on stage in New York: debut in Moon over Mulberry Street , and in Olivier and Leigh's Romeo and Juliet on Broadway; film debut in The Lady with Red Hair : short contract with Warner Brothers; then contract with 20th Century-Fox; 1945—role in A Song to Remember brought national popularity and leading man status; 1955—formed Theodora Productions; first film directed was Storm Fear , 1956. Died: Of leukemia, in Los Angeles, 16 October 1989. Parish, James Robert, and Don E. Stanke, The Swashbucklers , New Rochelle, New York, 1976. 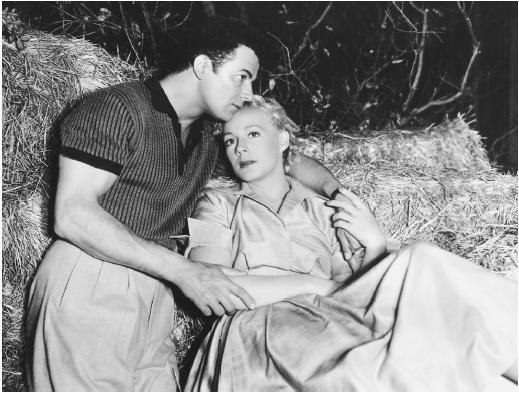 In spite of an early Academy Award nomination for best actor in A Song to Remember , Cornel Wilde has been remembered as a reliable masculine presence in a series of half-remembered films. Occasionally, as in DeMille's The Greatest Show on Earth , Wilde stood out. His vain trapeze artist who sees the light was a commentary on some of his earlier swashbuckling roles. In The Naked Prey Wilde's concept of individuality, survival, and loyalty is clearly evident. The film contains only a few lines of English dialogue. It is virtually a silent tour de force for Wilde. The tactile element in Naked Prey is, perhaps, one of the most singular features. Death and torture are graphic, nightmarishly so. The natives—initially seen as loathesomely barbaric—club, bake, stab, and torment their victims. Wilde, running naked through the jungle, tastes a plant, eats a snake, tumbles down a rocky waterfall, dances wildly in a brush fire. One by one, his pursuers catch him, and fall in individual and personal combat. As they pursue and die, mourn and argue, fight and weep, they become personalized and human for the viewer. The question, "What is a villain?," is made uncertain, as it is when dealing with the Japanese in Beach Red , the murderous young man in No Blade of Grass , and Lobo in Shark's Treasure . after much searching ALL my film books. as Cornel; thus the likeness is proved positive.